Anaerobic Digestion is an almost 200 years old technology that has evolved over the years. In Anaerobic Digestion (AD) process, organic materials get decomposed and broken down by anaerobic microorganisms in the absence of oxygen. 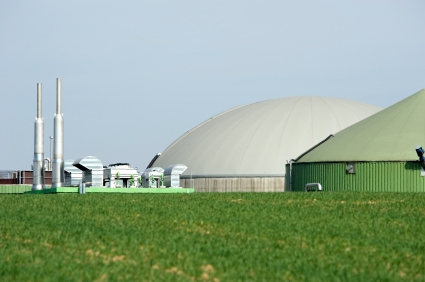 The main product of anaerobic digestion is biogas, which is an alternative and renewable energy. Biogas typically consists of 60% of Methane and 40% of carbon dioxide. Increasing demand for energy and scarcity of fossil fuel have created a renewed interest in alternative energy like biogas in recent years. In addition, biogas can be generated utilizing various organic products like food waste, plant and yard waste, oil and grease etc., that are considered waste. This waste to energy conversion has open up new economic and recycling options. Anaerobic Digestion technology can provide a complete solution to organic waste management. Biogas generated through the process can be converted to electricity or heat through Combined Heat and Power (CHP) generation unit. Biogas can also be refined further to pipeline quality gas (comparable to natural gas, which is 97% methane) and used as fuel to run public transportation or waste collection vehicles. Thus producing biogas from local organic waste can provide a stable, local supply of renewable energy. In addition, the nutrients and solid materials from the digestate (slurry output from digester) can be concentrated and converted to valuable resources such as compost or dry organic fertilizer. Thus, with anaerobic digestion of organic waste, it will be possible to offset a significant amount of fossil fuel consumption while keeping organic waste out of the landfill and avoiding associated greenhouse emissions. Anaerobic digestion can provide an alternative energy source which is promising in the midst of energy scarcity and rising oil price. Anaerobic digestion can convert waste to bioenergy, renewable fuels and valuable resources and thus divert waste from landfill and reduce green house gas emission. With the aim of maximizing biogas production, different feed compositions and process configurations were tried in the industry. Some advancement have also been made to solve existing operational issues and limitations like improving digesters mixing, enhancing feeding and withdrawing, eliminating foaming issues or simply increasing digestion capacity of existing digesters. Some of these advancements in process, technologies as well as feed composition have produced very promising and outstanding results.